In North Estonia the cloudberry fruits are still reddish and hard. Honey yellow and juicy when fully ripe, over-ripe berries are greyish yellow – in the old days they were called „pusheads“. Each part of the aggregate of drupes consists of a large seed and juicy surrounding flesh and there may be from one to thirty of them, but only one “berry“ at the tip of each shoot. 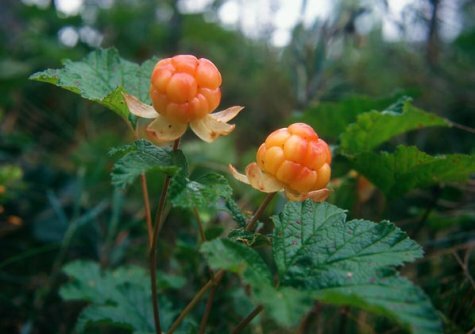 The leaves of the cloudberry are dark green and crinkled with five to seven blunt-tipped lobes; there is nothing much to confuse it with. Plentiful cloudberry years come at intervals of three to five years.